Remember that scene from “Up in the Air” when George Clooney's character is schooling Anna Kendrick's character on the art of moving quickly and efficiently through airport security? He warns her to steer clear of families with small children (never seen a stroller collapse in less than 20 minutes) and old people (their bodies are littered with hidden metal). He rolls his eyes at her lack of expertise as she's being wanded, and he's already moved past the TSA screening area. This has been my life for the past five years. Well, minus the flying around the country ruthlessly firing people and existing solely to earn one million frequent flyer miles part. My job is a hell of a lot better than that, but it does involve a ton of traveling. Let's just say that last year I was able to earn the Southwest Airlines Companion Pass without any bonus points or travel hacking. That's the equivalent of 100 one-way qualifying flights or 110,000 qualifying points. The last time I purchased a flight was three years ago to my best friend's wedding in Italy. Luckily, I've had an insatiable case of wanderlust for about as long as I can remember. I've visited most of the United States (all of the continental states except for New Mexico and Wyoming) and most of the big cities in Canada. While I haven't loved every place I've visited, traveling for work has provided me with the unique opportunity to see many places FOR FREE that I would never have otherwise bothered with. Like most folks, I adore visiting Chicago, San Francisco, New York City, Austin, Portland, and all of the other large, amazing, and popular cities that have earned their reputations for a reason. These are the places that your high school and college friends have moved to, places with the most hip and unique neighborhoods, places that are able to sustain the most innovative restaurants and bars, and the places that are the easiest to get to. But what about the smaller, less expensive, but still very cool cities that don't get the same amount of time in the spotlight? 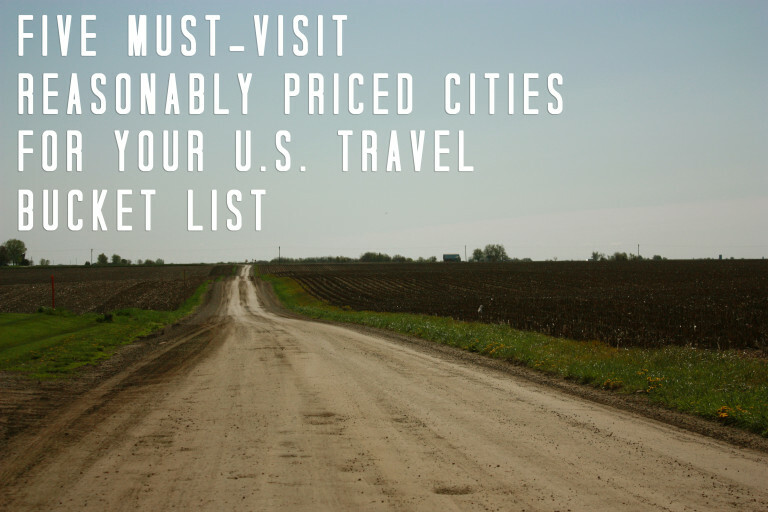 Below I've compiled my top five must-visit reasonably priced cities for your U.S. travel bucket list. Madison is one of my favorite midwestern cities (second only to Chicago). It's walkable, bike-friendly, impeccably clean, and it's located on an isthmus! It's a liberal college town with a fantastic arts scene, unlimited outdoor activities, and has one of the largest producer only farmers' markets in the country. It also boasts more restaurants per capita than anywhere else in the United States. Selected highlights: Olbrich Botanical Gardens, Wisconsin State Capitol, University of Wisconsin-Madison Arboretum, Lake Mendota, Ice Age National Scenic Trail, Madison Museum of Contemporary Art, Barrymore Theatre, Dane County Farmers’ Market. Best known for hosting the Kentucky Derby and the gateway to bourbon country, Louisville is a quirky and historic foodie town with a thriving arts scene. The French influenced city has a creative spirit and an amazing collection of restaurants. Selected highlights: 21c Museum Hotel, Speed Art Museum, Locust Grove, Old Louisville, Muhammad Ali Center , Urban Bourbon Trail, NuLu East Market District, Louisville Slugger Museum, Kentucky Museum of Art and Craft . Nestled between the Blue Ridge Mountains and Great Smoky Mountains, Asheville is a laid-back city with a crunchy community vibe. The city has an impressive restaurant scene with an emphasis on local ingredients, kickass rock clubs, endless outdoor activities, and the largest private home in the United States. To me, Asheville is the ultimate hideaway. A city of enormous natural beauty, Tucson has continually attracted all kinds of creative types who are inspired by a quieter life in this sprawling desert town. It's a sleepy college town known for it's vast natural beauty. Des Moines is another midwestern city that I've always enjoyed visiting. The capitol city and cultural center of Iowa, Des Moines is a friendly place that values agriculture and the arts. Readers: What unique and super cool smaller cities do you think deserve more recognition? Why? Like what you've read? Stay on top my latest posts by following Cashville Skyline on Facebook and twitter! Your top two are outstanding. Madison has a great feel, in a clean urban setting. Our best friends live there so we love to go….only in the summer! Louisville is great too. I really like how they converted the floodplain in town into passive parks and ball fields. Great urban planning! I need to find a way to get to all of these places more often. Luckily, Louisville is a short drive from Nashville (~3 hours) and Asheville is also drivable (~5 hours). I LOVE the Minneapolis/St. Paul area! I didn’t include it on my list because I put it in the same category as the big, popular places like Chicago. Doesn’t Minneapolis have more theaters per capita than anywhere else in the country except for NYC? Great list! It has been a few years since I’ve been to Madison, but have always loved it and what it has to offer. We live in Omaha and have been to Des Moines a number of times and really enjoy it – it is good size and plenty to offer. In terms of places I think are overlooked, I enjoy Bozeman, Montana. My Dad moved there a few years back and it’s a gorgeous place. Ah, I’d love to go to both Bozeman and Missoula! I absolutely love traveling to new cities, no matter how small or obscure they may be! Actually, the less touristy a place is, the more interesting to me. I made a brief stop in Madison on a cross country road trip and loved what I saw. Olympia, WA is very cool and left an impression on me, as well. Me too, Lauren! I’ve heard Olympia is a great town. I need to make another NW trip sometime soon. Love Santa Barbara AND Monterey in California. You don’t have to travel very far to visit somewhere interesting and fun. Probably next on our travel list in the US is a food tour of Chicago. I love how all these great cities also have such a distinct and amazing food culture! I wouldn’t even know where to start on a food tour of Chicago! So many delicious things to choose from. Great list! We would like to visit Kentucky in the near future. My husband likes bourbon and I like horses! Mmmm…bourbon. And I’ve always wanted to go to the Kentucky Derby! Louisville is my hometown! Represent! I have plenty of recommendations there. The 21c gallery is great. Frankfort ave, bardstown rd, new lou (market street) are all good areas. Definitely quirkier than people would think. And apparently it attracts and retains more young people than a lot of other places, so thanks for listing it here (http://www.theatlanticcities.com/jobs-and-economy/2012/09/portland-really-where-young-people-go-retire/3316/). Right on! I need to take another trip there really soon. Super cool town! Asheville is definitely a fave of mine. I actually never heard of it until I was sent there for work and it’s definitely affordable and fun city. I was lucky to go there for work, as well. I definitely want to get there more often, especially as the weather gets nicer. So many places to hike! I love Des Moines and Louiville. And call me crazy, but Omaha is one of the most bucolic urban areas, very quaint, but modern. I love it. I think in Arizona, I would have gone with Flagstaff (bad Tucson experiences). Its totally underrated. It’s got mountains (with actual snow) and the hippie vibe there is huge which isn’t necessarily a plus, but it translates into a lot of boutique shops that don’t have a commercial feel, which I enjoy. Great list and idea, Addison. I think the next mini vacation we take is going to have to be to Asheville- not to far from Mid TN. Asheville is great! And only about a 5 hour drive from Nashville. A craft beer paradise if you’re into that. I’ve heard nothing but good things about Madison, WI. I would love to go there! Yeah, the heat in the Southwest can definitely be a turn off. The summers in Tennessee are pretty brutal, though, so it doesn’t bother me as much. Haven’t been to any of these cities, but have heard great things about both Madison and Asheville. And I’m with you on Chicago; it’s a really great city. The southside is a bit rough though. Every time I would drive up to Chicago I’d always be awestruck at the way the city just rises up out of the ground. It’s breathtaking, especially at night. Ahhh, Chicago. I think I may get there next week for work and your description just made me excited. We mainly stuck to the big cities while road tripping the US, but quite liked Burlington and Flagstaff! Also San Diego though not sure if that counts as small. You’re the second person who has mentioned Flagstaff. Clearly, I need to check that place out! Seconding Monterey and Santa Barbara. Also love San Diego and Boston (although that’s a big city). Never been to either Monterey or Santa Barbara! I’ll have to put those on my list. All of these 5 destinations are so great. I would want to visit Des Moines, IA especially for the dact that I apprecieate agriculture of arts so much and I heard a lot of great things about this place. I wish to be here with my family soon. Thanks for sharing! Thanks for commenting, April. I love these places!